Home » Blog » Tim Hortons Cardiff. High Level Shop Front Re-coating. 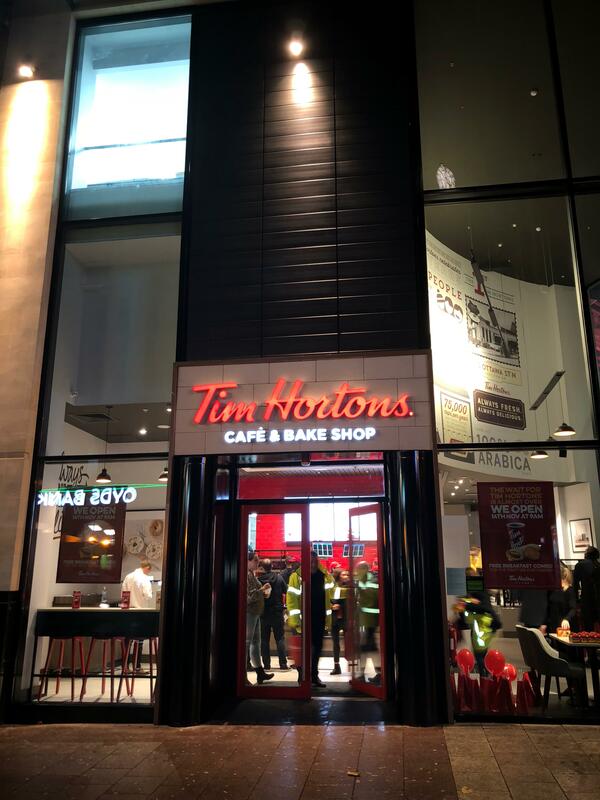 Vanda Coatings were proud to work on this prestigious project as part of the Tim Hortons launch into the UK. 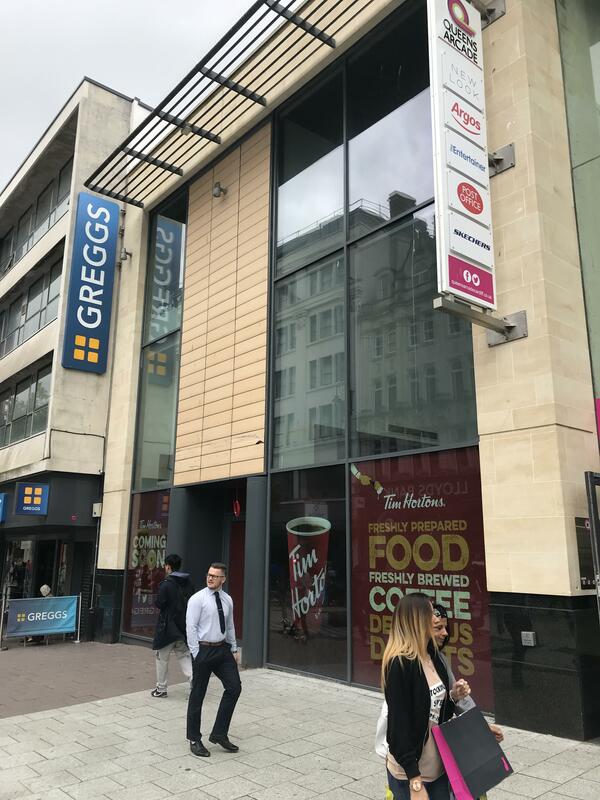 As part of the refurbishment project, there was a requirement to recoat the high-level aluminium shop front sections to the Tim Horton colours. Vanda Coatings operatives carried out the shop front re-coating on the Canadian coffee chain new opening. Tim Hortons is one of Canada’s most popular brands serving 8 out of every 10 cups of coffee in the country and is larger than both KFC and McDonalds combined there. Starting in 1964 they have grown and branched out globally. The second branch to open is Queen Street in Cardiff and there are plans to open many branches throughout the UK. 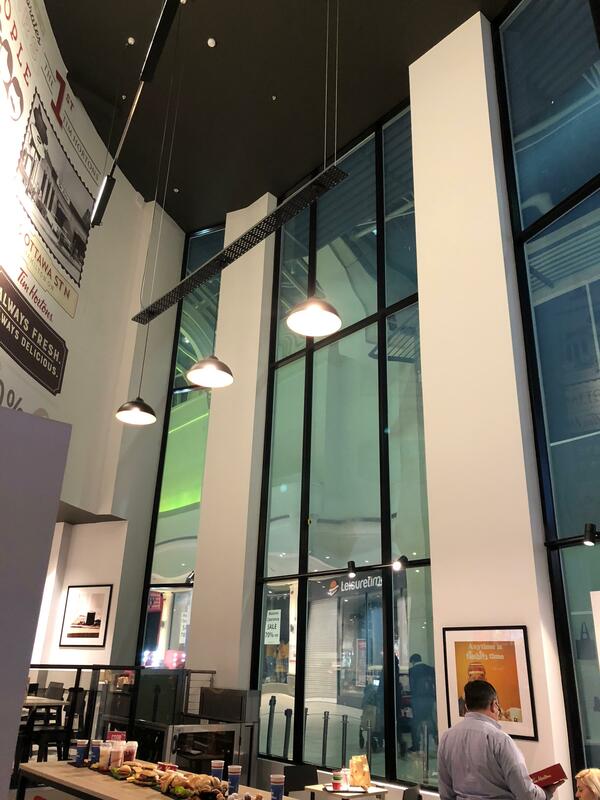 As part of the shop fit Vanda Coatings were required to re-coat high-level aluminium powder coated window framework to internal and external sections as well as the exterior tiled sections. The store had three colours applied to different sections, black grey and red of the Tim Horton corporate colours. 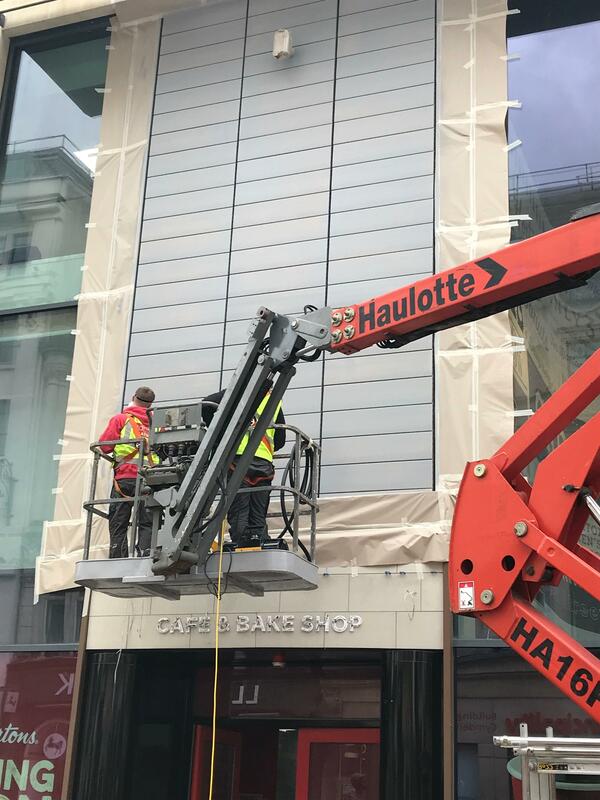 Working on a high street location and with other trades present, always provide challenging conditions but experienced spray painting applicators Luke, Michael, Jac and Gareth proved they were up to the task. Vanda Coatings carry out a lot of these type of projects where one company take over the lease of the shop from another and therefore need a corporate colour change. In this instance, a Footlocker was located at the site and Tim Hortons decided on taking the unit as part of the expansion into the UK. This store was located on both the main high street and within the shopping centre. As with the design of many modern shopping centres, the storefront often has tall frontages to allow in maximum light and offer displays. For this project, our trained operatives had to access the high-level framework from a cherry picker. Vanda Coatings have worked on the majority of high street chains since the business was started 20 years ago. Find out more about our shop front spraying service.